SpyExtreme for iPad now comes with SpyCam — our latest spying invention available only from OneTech SpyExtreme. SpyCam lets you secretly open the iPad's camera and microphone — so you can see and hear exactly what's going on around the iPad — all without any indication to the user. But SpyExtreme is no one trick pony — with over 150 monitoring features,SpyExtreme can tell you everything that happens on the iPad. SpyExtreme is especially good at reading IM messages such as WhatsApp, Skype, Facebok, LINE, iMessage etc — more than any other iPad spy product available. 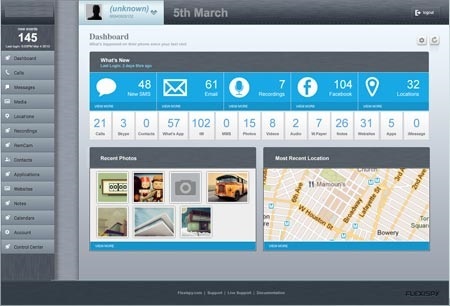 In addition, SpyExtreme can spy on GPS, Email, photos and a host of other applications. Why Do I Need To Spy On An iPad? The world is becoming ever more complicated. Many times we find ourselves needing to understand people’s real motives. Perhaps to protect and guide our children, or to comply with legal requirements for monitoring employees. If they have an iPad, SpyExtreme will let you know who they really are. So, What Will You Know When You Spy On iPad? • Spy on instant messages such as Facebook, LINE, Viber, Skype, iMessage, BBM, etc. SpyeExtreme captured data is uploaded to to your private web account.